Media: A5 sized, soft cover with 46 pages, 39 black and white photograpgs, 5 full colour art-works (3 are profiles), 13 lists of various kinds and 11 pages of text. Advantages: Hopefully, the first of many and a very timely release, many of the photos I've never seen before, excellent artwork by Malcolm Laird, interesting and informative lists of Squadrons, aircraft and pilots. With the recent release of Xtrakit’s Spitfire Mk.XII in 1/72 scale, the only references I had were generic Spitfire books. There were few photos other than 41 Squadron aircraft, almost ignoring the more successful 91 Squadron. To make matters worse, Xtrakit only put 41 Squadron markings in their kit, although I hope that we will see a new issue of the kit in the future with 91 Squadron markings. In the meantime, here is a book that will help. Allied Wings by Phil H. Listemann is published in France, in English, preceded by several under the title of Famous Commonwealth Squadrons of WW2 which cover Nos. 310 (Czech), 457 (RAAF), 485 (NZ) and 501 (County of Gloucester). 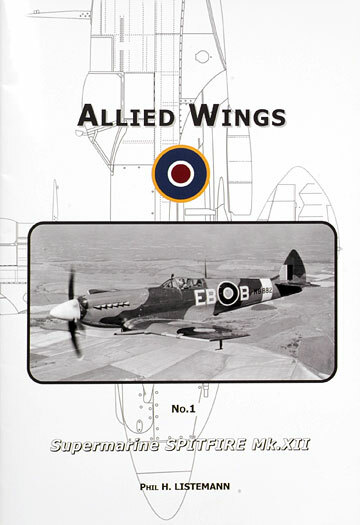 This new series, Allied Wings, is the first about particular aircraft, in this case the Supermarine Spitfire Mk. XII, the first of the Griffon engined Spitfires and will be followed by No. 2, Martin Marauder Mk. I. This small book is in A5 format, with only 46 pages plus soft cover but it is packed full of interesting text, photos, colour artwork by Malcolm Laird. Various tables and lists are also included, just right for the Modeller or Historian. Starting with 4 pages of text, photos and lists covering the development and issue to 41 Squadron (EB), the first to receive the type. 10 pages of 41 Squadron operational history while using the Mk.XII follows. As well as text, photos and lists, there are two side profiles in full colour of EB-B, MB882 and EB-A, MB795. A full colour plan and underside view of EB-A is shown on page 41. Next is six pages on No. 91 (Nigeria) Squadron (DL), the second of only two Squadrons to fly the Mk.XII in numbers. It begins with a side profile of DL-E, EN617, the regular aircraft of Pilot Officer Albert G. O'Shaughnessy, again by Malcolm Laird. 91 Squadron only operated the Mk.XII for 10 months from the 21st of April, 1943, to the 28th of February, 1944. 41 Squadron stated earlier in Jan/Feb, 1943 to the 12th of September, 1944 but from April 1944, 41 Squadron took on the V1 flying bomb menace and were quite successful at it. After 41 and 91 Squadrons replaced their Mk. XIIs with Mk.XIVs, the surviving XIIs were passed to second line units and all had been struck off charge by July 1947. The second half of the book has very little text and consists mainly of lists and tables such as Operational Diary-Numbers of Sorties, Users, Bases, Claim list of Mk. XII Units, Aircraft Losses, Time of Operational Use and Honour Roll. Among these are several more photos and 1 colour map. With the Xtrakit Mk. XII being one of my next aircraft projects, this book has come at just the right time and if Xtradecals will put out some 91 Squadron markings, I will build it as one of theirs. If not, 41 Squadron will have to do but either way this book will be invaluable to me.